Deen Dayal Upadhyaya Grameen Kaushalya Yojana (DDU-GKY) is the skilling and placement initiative of the Ministry of Rural Development (MoRD). DDU-GKY has its origins in the Aajeevika Skills programme and the ‘Special Projects’ component of the Swarnjayanti Gram Swarozgar Yojana (SGSY). The scheme focuses on catering to the occupational aspirations of rural youth and enhancing their skills for wage employment. For more details, please read the DDU-GKY Programme Guidelines. Implementation of DDU-GKY involves State Governments, Technical Support Agencies like the National Institute of Rural Development and Panchayati Raj (NIRD & PR), and Project Implementing Agencies (PIAs). 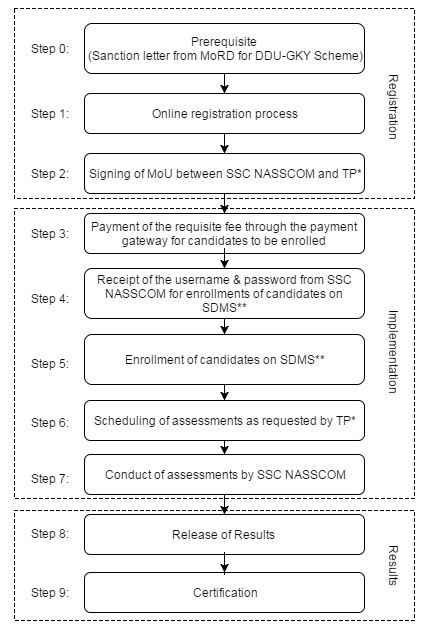 Parties interested in running a DDU-GKY training program and assessment in partnership with the IT-ITeS Sector Skills Council NASSCOM are expected to produce a sanction letter from MoRD for the same, followed by the process detailed below.